The November skies are getting a bit less sunny. Lemons and cherries helped brighten things up, and today's warm chocolate dessert. 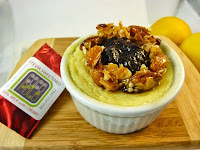 I melted part of a milk chocolate cherry bar from Coco Polo (Highland Park, NJ), and used it to top a lemon souffle, along with some chopped almonds and apricot bits. Today was Day #4 of Chocolate and Lemon Theme Week.